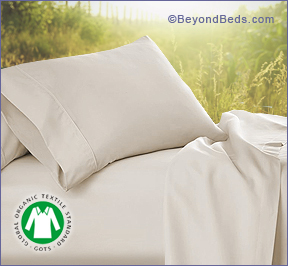 GOTS Certified (Global Organic Textile Standard) made from long staple single-ply organic cotton.These incredibly soft, expertly tailored sheets have a five-star hotel feel, are breathable, naturally hypoallergenic and free of pesticides and carcinogens. Sourced from factories that meet the strict standards of GOTS certification. Global Organic Textile Standard (GOTS) is the worldwide leading textile processing standard for organic fibres, backed up by independent certification of the entire textile supply chain. A textile, or in this case sheets that carry the GOTS label grade ‘organic’, must contain a minimum of 95% certified organic fibres, and be free of critical inputs such as formaldehyde, toxic heavy metals, aromatic solvents, chlorine bleach, functional nano particles, GMO'S genetically modified organisms. BeyondBeds.com only sources from small honest and trusted suppliers. If you have any questions regarding our organic sheets please feel free to contact us. “Know what you're sleeping on”. Sets include 1 flat sheet, 1 bottom fitted sheet and 2 pillowcases. Split size sheet sets include 2 fitted bottom sheets, 1 flat sheet, 2 king pillowcases. Care: Machine wash warm or cold, dry low. Excessive drying may cause shrinkage. We recommend removing promptly from dryer for less wrinkles and fabric care.